At some point or other, any indie author must wonder how they really feel about Amazon. I freely confess I’ve been all over the board with my attitude towards this extraordinary organization. Some few of us will remember that Amazon began as a bookstore, and just a bookstore: music, video, and software followed soon after. Twenty-four years after its founding, Amazon’s dominance of the book space is such that no indie author stands a chance of attaining any significant visibility, let alone success, without them. Those of us who’ve “gone wide” with some of our titles, i.e., have chosen to make them available through several other online retailers, have probably noticed that somewhere between 70 percent and close to 100 percent of our sales come from Amazon. In fact, according to the 2017 authorearnings.com report, Amazon accounted for a whopping 83 percent of US ebook sales. With just 9 percent of market share, Apple iBooks is a very distant second place finisher. Among the many reasons that Amazon remains so dominant is that it has the absolute best and most indie-friendly search engine among all the online booksellers. Publishing through KDP therefore gives your book the best chance of discovery… with a caveat. In order for your book to benefit fully from Amazon’s search algorithms, including “also-bought” listings and the like, you really need to enroll in KDP Select, the Amazon program that gives Amazon exclusivity for ninety days (renewable). In return, you get some marketing and promo options (e.g., five days you can set your book price to free) not available to you if you “go wide” and list your book for sale with other retailers. Scratch Amazon’s back, and they’ll scratch yours. Furthermore, there’s the often agonizing decision about whether to list your book with Kindle Unlimited (KU), Amazon’s subscription program which allows members to “borrow” an unlimited number of eBooks each month. Today, the author gets a pittance for these borrows, typically around half a cent per page read; that means that if your whole 200-page novel is read, you get around a buck, as opposed to $2+ if you sell your book at the popular and widely-used $2.99 price point for indies. Sounds like a terrible deal, right? Why would anyone do that? Well, there are two very good reasons: first, you get a nice rankings bump on those page reads; second, and very important, there’s very little overlap between KU subscribers and regular customers who buy books on Amazon. Think about it – why would you buy a book when you can borrow it at no extra cost? Having your book on KU is very unlikely to lose you any actual sales – on the contrary, it’s all gravy, in the form of extra exposure, reviews, and a modest royalty from the page reads. All this said, the decision to go exclusive or not with Amazon needs to be made when the book releases, since once the book has been widely distributed, recall can be difficult and time-consuming, and KDP won’t hesitate to slap down and even punish authors who try to enroll a book when it’s still available elsewhere. But go exclusive with KDP, and that (small) percentage of readers who are passionate Apple adherents or who, for whatever reason, hate Amazon won’t be able to buy your book for a minimum of three months. I’ve been back and forth over this myself. There are good philosophical arguments for going wide from the get-go, but it’s hard to see sound economic reasons for passing on the chance to initially go exclusive with KDP and KU. The good arguments are mostly ones of principle and ideology: nobody likes to encourage a monopoly, especially when that company doesn’t hesitate to throw its weight around. And I don’t just mean with its rivals, but with us, the content creators. But if I’m to be honest, I have to say I wish I’d gone exclusive on KDP for at least one ninety-day cycle when I first released my previous books: I think I’d have done a lot better, and got a lot more traction out of the gate, as a result. In the final analysis, I’m less annoyed with Amazon than I am with B&N, Apple, Kobo, et al. Amazon, after all, is just doing what a smart company does – it’s striving to be the best, to deliver awesome customer service, and to maximize profits; they do a damn good job of all those things. B&N, Apple, Kobo, et al, on the other hand, have (i) failed to implement search and discovery algorithms that can hold a candle to Amazon; (ii) not understood what the customer really wants (yes, the perception, if not always the reality, of bargains is a big deal here); and (iii) all folded rather than stand up to the majors of traditional publishing to level the playing field for indies. Yes, 800-pound gorillas are scary. But when I’m trying to get purchase in a marketplace where 4,500 ebooks are published daily, I’d rather have that gorilla on my side than a cute little capuchin monkey. Donna, thank you so much for that, and I'm glad you found my post helpful. The decision to self-publish or not is a complex one in an ever-changing ecosystem, and one I discuss at some length in "Drown the Cat." Excellent post! You answered so many questions that have been rolling around in my head. Thank you so much. 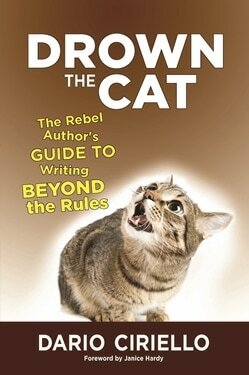 Drown the Cat sounds like a book I need! I felt it was important to get this perspective out there, since I'm sure many other authors find themselves ambiguous about Amazon. The worst for me was when they rolled out their paid promotions *after* having hurt indies by cracking down (in their typically arbitrary way) on reviews of our books by other authors and friends. But love Amazon or hate them, one thing is for sure: we can't ignore them. Great post Dario. I really think I agree with you. Of course we've all deliberated on these questions. After going KDP select for several cycles with my first two books, I then went wide with them and released my third book wide. I'm so disappointed with what I'm able to do with the other vendors. Sales are negligible, and I wonder what I've lost or compromised by opting out of KDP and KU. Unless I promote on a third party site, no reader will ever find my books on the other platforms. AND uploading and managing books on the other platforms can be frustratingly difficult and inconsistent. You raise all the important points in this article and offer a balanced perspective. Thank you.